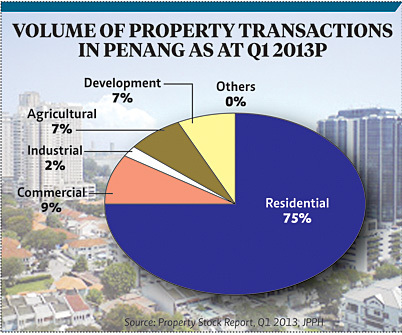 Despite a softer property market in the first quarter of this year, Penang's residential sector has continued to claim the lion's share, or 75 per cent, of the total 5,756 properties transacted. A research report by Henry Butcher Malaysia Penang shows that the total number of properties transacted in the first quarter of this year fell 18 per cent compared with the 7,007 transactions recorded in the same period last year. "However, despite a drop in the number of transactions, the total transacted value of residential properties increased by 3.5 per cent in the first quarter of 2013, due to the relatively strong demand from home purchasers as well as property investors, coupled with the limited supply of residential stock in the market," the report stated. The Penang government last year imposed a guideline on the minimum purchase price of property for foreign investors. On Penang island, the minimum prices for strata-titled and landed properties have been capped at RM1 million and RM2 million, respectively. For permanent residents, however, the existing limit of RM500,000 is retained. Applicants under the Malaysia My Second Home programme are not affected by the new ruling as the minimum price remains at RM500,000, but with a limit of two units only. Transactions involving foreigners numbered 774 in 2010, or 2.98 per cent of the total, while in 2011, there were 890 transactions, or 2.26 per cent of the total. Stating that property investors are beginning to revive or resume their investment interests in Penang, which were placed on hold for about one-and-a-half years due to uncertainties over the date of the 13th General Election, the report further noted that astute investors are of the opinion that buying properties in choice locations in Penang appears to be the preferred mode of wealth creation. "Consumer confidence of both local and international investors on Penang's properties remain buoyant and, therefore, Penang's property market is foreseen to be filled with more excitement soon."